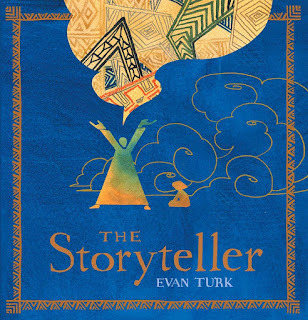 In his enthralling new picture book The Storyteller, Evan Turk celebrates the way stories bring hope and inspiration to people young and old. Read aloud this wonderful picture book with children ready for a longer, more complex story. Our 3rd graders loved it and we had a fascinating conversation about the author's motifs, artwork and messages. A thirsty young Moroccan boy searches through a busy, chaotic city for a drink, but no one has any water to share. As he walks home, an old storyteller calls out to him, assuring him that his thirst will be quenched if he listens to a story. 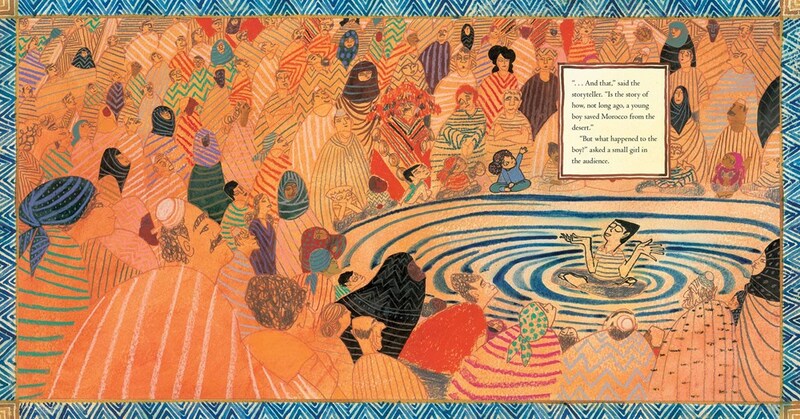 The storyteller spins a tale of the terrible drought and how one family always had enough water to share. The young boy is enthralled, and by the time the old man has finished speaking, the boy's cup is miraculously filled with cool water. Day after day, the boy returns to hear more stories--and Turk masterfully layers each story within a story, linking themes, motifs and stories together. The boy returns each day to hear another installment of the storyteller's tale. 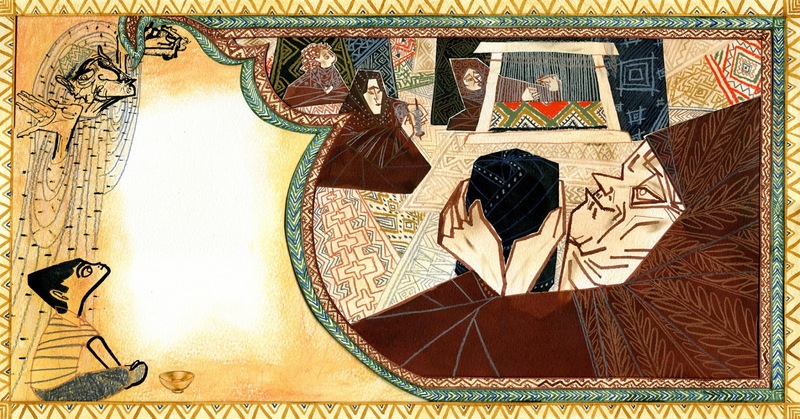 At first, my students were a little confused how the storyteller told a story about an old woman telling a story about another woman stealing a bird--but as we talked about it, they started nodding and whispering to each other about things they noticed. Look below and notice the old storyteller on the left telling the young boy the story -- it almost spins out of his hands. And notice how the border encircles the the old woman on the right carrying the bundle of cloth--for she is the center of the new story. 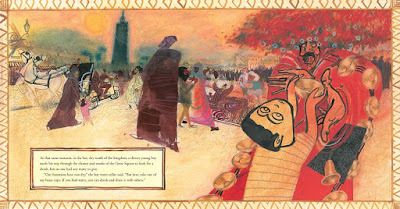 Turk was inspired by many things as he created this story: the storytellers of Morocco, or hlaykia, who tell stories in the public squares; the traditional carpet weavers in Morocco, who pass on stories through their artwork; local artists in Ait-Ben-Haddou, an ancient fortified village in southern Morocco. Turk shows in this video the way he created the vibrant jewel-toned blues and warm golden-sand browns in his artwork, using a technique he learned from these Moroccan artists. In turn, he was inspired by the Austrian artist Gustav Klimt, who used many jewel-toned colors and geometric patterns in his portraits. This is a book that will benefit from many repeated readings, just like traditional stories benefit from being passed on from storyteller to storyteller. Readers will notice new details each time they share the story, whether it's the way the bird symbolizes hope (echoing the story of the phoenix), or the way the blue of the water slowly fills the patterns as the stories take hold. Other readers notice that the boy starts out quite alone with the storyteller, but that he's surrounded by community by the end of the story -- because stories bring people together. 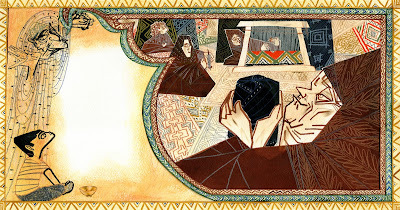 "'...And that,' said the storyteller, 'is the story of how, not long ago, a young boy saved Morocco from the desert.'" I just wish you could have watched my students whisper to each other as they realized that the young boy turned into the storyteller by the end of the story. There was a quiet buzz that went through the room, as they noticed the different people in the crowded square, and recognized the power of the storyteller to banish the djinn to the desert. The Art of "The Storyteller"
Inspiration & Resources for "The Storyteller"
Illustrations © Evan Turk, 2016, shared with permission from the publisher. The review copy was kindly sent by the publishers, Atheneum / Simon & Schuster, and we have purchased additional copies for our library. If you make a purchase using the Amazon links on this site, a small portion goes to Great Kid Books. Thank you for your support. Looks like a gem. I'd love to see this read aloud in a group.